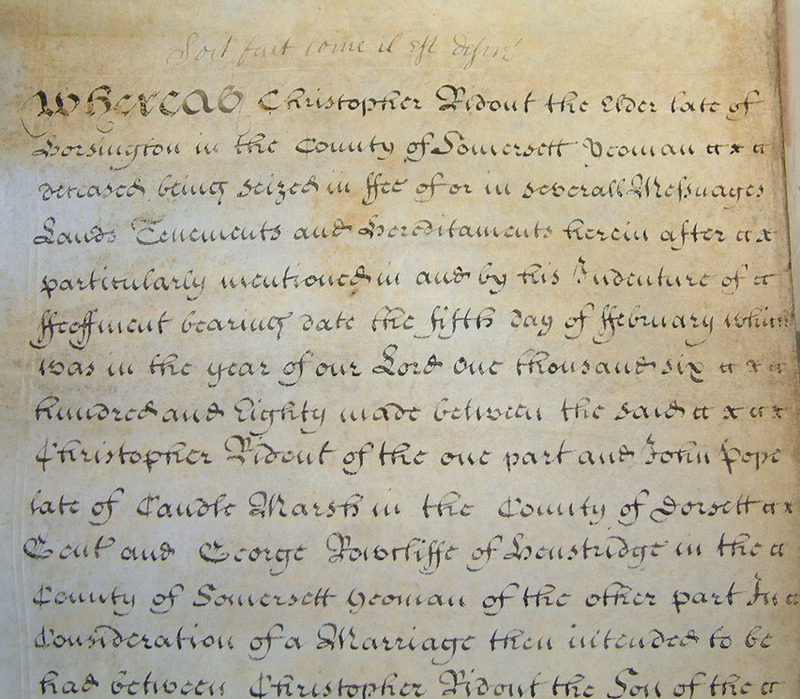 To genealogists and family historians from the United States of America and Canada, the name Christopher RIDOUT may be very familiar; in fact many of those folk regard this man as being their principal ancestor and will also know that Christopher married Mary GLOVER in Sherborne on 21st November 1697. What appears to be unclear in many minds, however, is just who Christopher actually was – so this is an introduction to not one but two Christophers. Henstridge is a sizeable village in Somerset, about five miles ENE of Sherborne. This part of Somerset is still very rural and in the seventeenth century was mostly agricultural land and pasture, with a sprinkling of cottages and farms. In the village, the parish church of St Nicholas was probably where Christopher RIDOUT, son of Christopher RIDOUT of Henstridge and Edith (sometimes Judith) BLACKMORE of Hinton, was baptised on the 2nd November 1664 and where his parents had married seven years earlier. 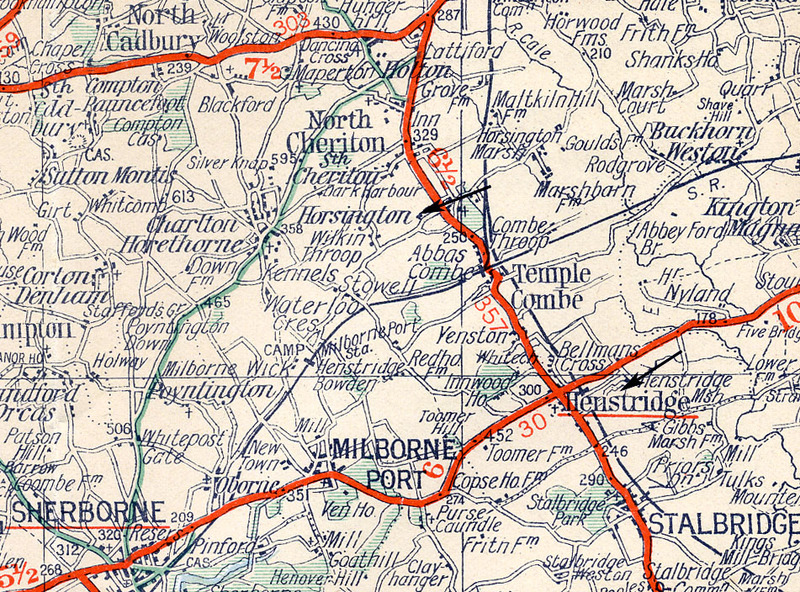 Young Christopher’s father and his Uncle William were both yeoman who held lands, tenements (houses) and messuages (dwelling houses with outbuildings and land) in nearby Horsington and Horsington Marsh, including a farm called Maltkiln Hill, which is still there today (just above the Horsington arrow). When William died in 1669, he bequeathed his five year old nephew Christopher ‘lands and grounds’ called Even’s Moor to be received when he was older and, of course, Christopher’s father would also leave him his estate in due course. The boy grew up and, when he was seventeen, in anticipation of a union between him and John POPE’s daughter, Christian, the two fathers drew up an agreement, on the 5th February 1680, by which lands and money changed hands in order to secure Christian’s marriage portion (dowry). Soon afterwards, Christopher and Christian married and had two boys, William (b. 1683) and John (b. 1685) but an unfortunate sequence of events then followed that would bring about an Act of Parliament. Firstly, Christopher RIDOUT’s father died, leaving considerable debts, and then soon afterwards Christopher’s son John died, then his wife Christian. Finally, at just thirty, Christopher himself died and was buried on the 14th November 1694 leaving young William as the sole survivor of the family. Like his father, Christopher had borrowed sums of money and set up mortgages, probably quite a common practice in those days, but after his death his creditors couldn’t claim their dues from his estate as legally it belonged to William, who of course was a minor. Parliament was petitioned and put into motion a Bill which went through both Houses in the spring of 1696 and finally received Royal Assent on the 10th April of that year. The purpose of the Bill was to enable certain portions of Christopher’s estate to be sold in order to pay his debts. Trustees were appointed and sold Maltkiln Hill Farm to Thomas HUSSEY of Horsington for £1,250. Hence the creditors were satisfied and at least some of the estate was preserved for William, who would later become a haberdasher and a citizen of London. He died in 1736. A few years ago, I went to the House of Lords Archives and was allowed to handle, unroll and photograph the original Ridout Bill. It was an amazing experience. But, however interesting the story is, this Christopher is obviously not the man who married Mary GLOVER in 1697! However, on the 12th February 1669, in Sherborne Abbey, another Christopher RIDOUT, son of John RIDOUT and Elizabeth OLIVER, was baptised. This man would live a long life, marry twice and have sons that would one day sail the oceans to the American sub-continent where today many hundreds, if not thousands, of his descendents still live – whilst some of us just stayed put for the past three hundred and fifty or so years! This entry was posted in Individual and tagged Christian POPE, Christopher RIDOUT, Edith BLACKMORE, Henstridge, Horsington Marsh, Maltkiln Hill, RIDOUT, Sherborne, The Ridout Act 1696. Bookmark the permalink.